Great banner again (a job well done), wonderful film. It always lifts my spirits. Thanks a lot, Peter! Puck's banner makes me want to watch it again - wouldn't it be great if we could all watch it together? That would be fun! Fantastic banner, fantastic movie, great! 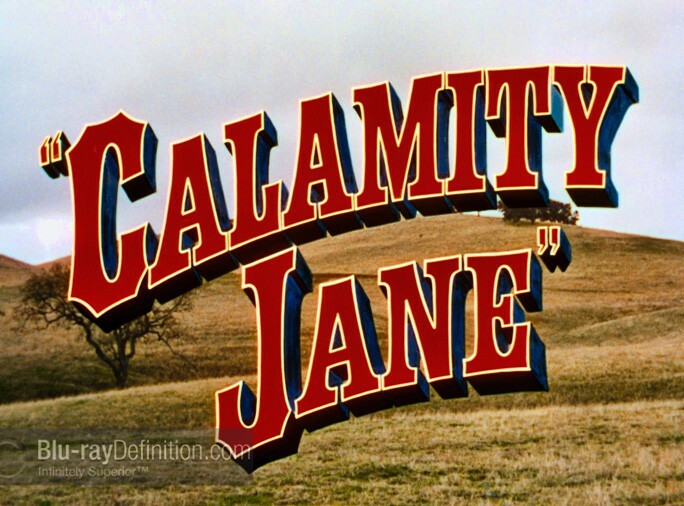 I love this Calamity Jane banner. This film really illustrates so many of Doris' talents as an actress. In Calamity Jane she was tough and tender. She could stand up to every man in the film. She sang Secret Love with true sincerity and heart. She rode a horse and a stagecoach. She shot a gun. She could do broad comedy that was hilarious. She fell in the mud. During all these adventures, Doris looked incredibly fresh and beautiful. Calamity Jane brings back so many joyful memories. I love this particular banner showing Doris' character standing up to a man just as she did in most of her films. Thank you Bryan and Puck. The amount of screen time Doris shared with another actress in a prominent role was significant. Allyn Mc Lerie as Katie sang, danced and was Doris' romantic rival. I can only think of two other of Doris' films where there were secondary female leads. In Young At Heart, Dorothy Malone and Elisabeth Fraser played Doris' sisters with their own love stories. In Move Over Darling, Polly Bergen had a standout comedic performance as the new bride. 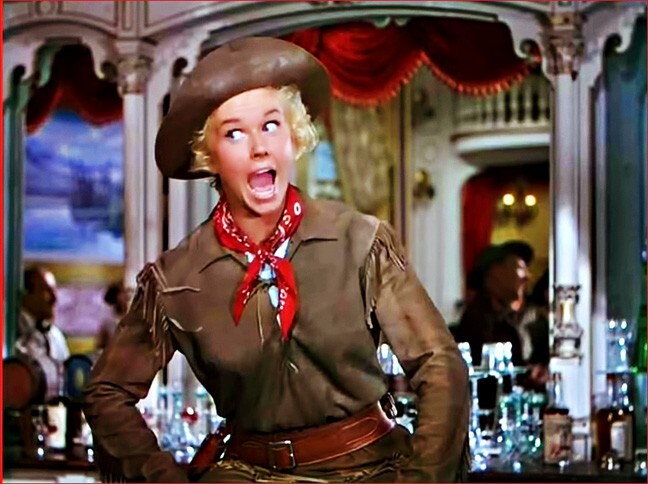 The other aspect in Calamity Jane was Doris' strong performance in competing equally with the male lead character as she did in most of her films. She championed equality for women. In the Moon films, Doris as Marjorie was more than a match for Gordon Mac Rae. In Love Me or Leave Me Doris as Ruth Etting challenged James Cagney's tough guy Marty every step of the way. In The Pajama Game Doris as union leader stood up to factory boss John Raitt. In Teacher's Pet, again Doris as a journalism teacher was a strong match for the tough, charming journalist played by Clark Gable. In It Happened To Jane, Doris was a superior match for Ernie Kovacs who played the railroad boss. In Pillow Talk and Lover Come Back, Doris and Rock Hudson were at their zenith in the battle of the sexes. In Billy Rose's Jumbo, Doris strong performance kept the circus going despite the failings of dad, Jimmy Durante and love interest Stephen Boyd. In The Glass Bottom Boat Doris outmatched Rod Taylor's character. In The Ballad of Josie, Doris shines as a feminist rancher in mainly a male chauvinist environment. In With Six,You Get Eggroll, Doris runs a construction company and is more than an equal match for gruff Brian Keith. The three films where Doris plays a victim are Storm Warning, Julie and Midnight Lace. As good as she is in these films, there is a strong essence in Doris' film personality that inform us she will survive. The irony is that she was victimized in her marriages to Al Jordan and Martin Melcher. Doris' gift as an actress in all her films was to make her characters strong, interesting and likable which always made the audience champion her. Thanks for the banner comments, Peter and Johnny, I know Puck will really appreciate it. Beautiful Calam banner - I read Doris was considered for a part in Dallas - am glad now she didn't do it- I think it was the part Alexis Smith took . Thank you Bryan and Puck for another beautiful Doris banner that celebrates the joy of the film Calamity Jane. Thank you all for your sweet comment, do love, do adore “Calamity Jane” one of my favorites, Bryan did create an amazing banner. Many thanks to you Bryan !!!! Thanks, Puck, we all appreciate what you do! Hope people are having a relaxing Easter break! I mentioned this recording session earlier - don't they look like they are having fun! Thank you so much Bryan for the terrific photo of Doris and Allyn Mc Lerie recording A Woman's Touch. It is new to me. It makes me wonder if there are other photos of Doris recording with other co-stars. I love, love the Bugs Bunny, images. I used to do impersonations of him constantly and drive my parents and brothers to distraction. Two Halloweens I dressed in a Bugs Bunny costume. You might say Bugs was my hero and I love him to this day. There is no other character with a more positive and can-do attitude. 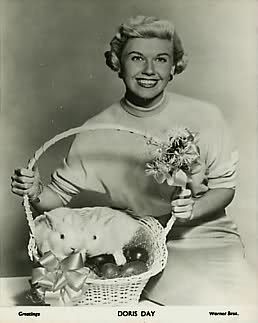 Having Doris Day and Bugs Bunny as positive influences growing up is definitely great gift. Thanks for the Calamity Jane banner. Love that film! 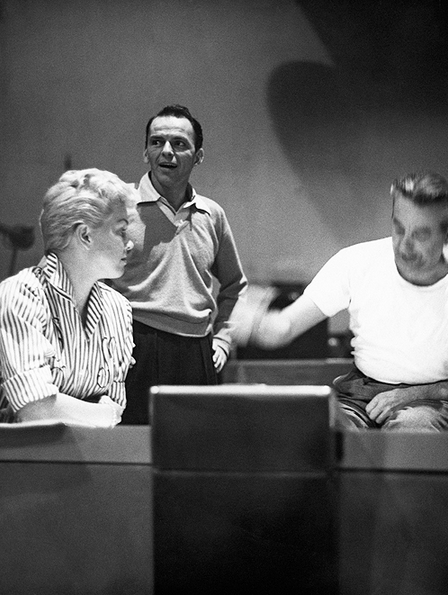 Johnny: There are some photo's of Doris and Frank Sinatra around in the studio working on Young At Heart. Happy Easter to you all, and thank you Bryan, you made that image amazing. Thanks, Puck, Happy Easter to you - and glad you are willing to share the space with Bugs Bunny. Such lovely Easter banners from Puck and Bryan. So bright and colorful. Doris Day's second film "My Dream is Yours", Release date 1949. She did this number called "Freddie Get Ready" with Jack Carson and the famed cartoon character Bugs Bunny. Thank you Bryan for the "Freddie Get Ready" clip. It reminds us to celebrate the childlike joys that stay within us. Doris has never lost the sparkle of childhood enthusiasm that is so appealing. Thank you Puck and Ania for all your beautiful creations you share with us on the Doris Day Forum. They are a true tribute to Doris and so enjoyable to see.